• Alex Rins working on the pace to prepare the race. The first day in Southern Spain’s newly named Circuit of Jerez – Angel Nieto saw sunny skies and plenty of improvements for Team SUZUKI ECSTAR’s riders. 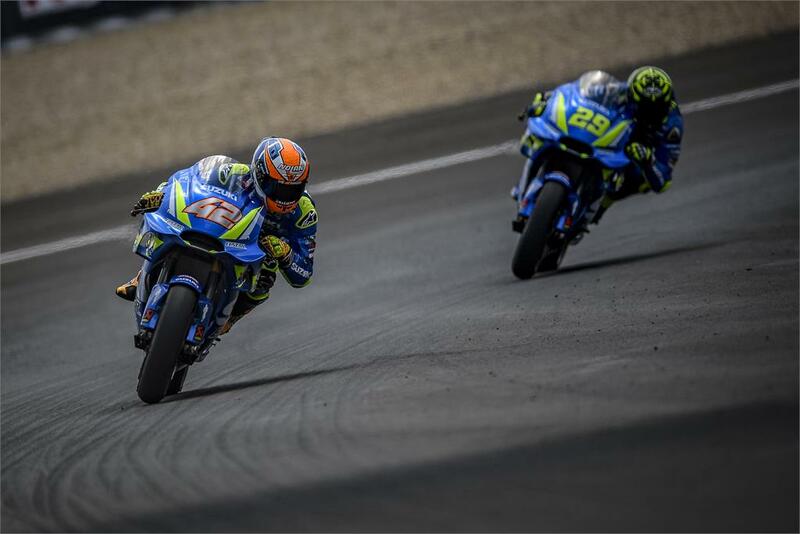 The tight and technical circuit was predicted to be a challenge for the GSX-RR’s characteristics, but early signs show that Andrea Iannone and Alex Rins are able to overcome and adapt. The morning’s FP1 session was used for getting the feel of the resurfaced track, but Andrea Iannone was able to start the session well and maintain lap times around the Top 10, even on a used tyre. For Alex Rins it was a more difficult start to proceedings as he familiarised himself with the circuit and the feel of a MotoGP bike here – the Spaniard missed the Jerez race last year due to his arm injury.